This interview takes place at the Violet Ray Gallery in Manhattan, New York where Joni's photographic exhibition, Green Flag Song, displayed September 25 through October 10, 2007. Joni talks with CBS News Sunday Morning program's national correspondent, Russ Mitchell, about the days she used to pay for art school by playing music at coffee shops for $15. She also gives a brief tour of the exhibition and touches on her ballet production of The Fiddle and the Drum. I learned a bit more about Joni on this interview. Love the work, want to get a piece of the art... do you ever do a trade? I am down in Australia and a lifelong fan. If may be your finest work to date, Just astounding. 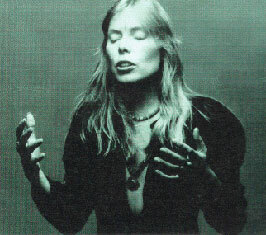 In my opinion, Joni's the greatest singer ever, not to mention wonderful songwriter, guitarist, pianist, artist. But I have to say, I'm so sad to see her with a cigarette. Joni, if you happen to read this, you are so talented, why do you want to poison yourself? Please stop, before it's too late. Those tobacco companies don't care about your life, but we all do. Just please quit. And be busy being free. Please stop.